Mark, Angel, Maureen, Roger, Collins, Benjamin Coffin III, Mimi: Five hundred twenty-five thousand six hundred minutes. Five hundred twenty-five thousand moments so dear. Five hundred twenty-five thousand six hundred minutes. How do you measure, measure a year? In daylights, in sunsets, in midnights, in cups of coffee. In inches, in miles, in laughter, in strife. In five hundred twenty-five thousand six hundred minutes - how do you measure a year in the life? How about love? How about love? How about love? Measure in love... seasons of love. Q: Which characters are gay? Q: What kind of camera does Mark use? Q: Which actors are gay in real life? There is no replacement, alternative or better place to see a Broadway musical than in, where else? Broadway...Nowadays however, some of Broadway's best are also being made for the silver screen and are surprisingly well done. 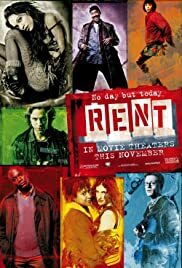 If you've already seen "Rent" on Broadway and want to see it on film, I strongly suggest you go for it. If you haven't seen it, it may seem to be corny or "hokey" in a few places but get past that because behind it are a set of story lines that will grab you by the library of your literary innards and hold them attentively until the credits roll. Jesse L. Martin, known on the small screen for his role Detective Ed Green since 1999, is one of the stars who will send auditory shockwaves your way with his beautiful voice. I had no idea he could sing and oh yes! He can definitely sing. The lyrics throughout the production are unforgettable and must be listened to. 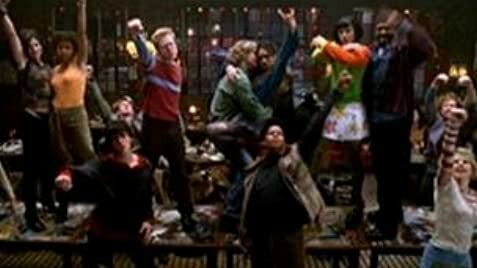 This segment of, "Seasons of Love" sets the theme for the movie and rings true for us all. "It's time now to sing out, Tho' the story never ends Let's celebrate Remember a year in the life of friends Remember the love! Remember the love! Seasons of love!" In closing, you'll laugh, cry, cheer, sing, laugh and if you haven't done all of these, see it again because you missed something. This is definitely a rock opera of an era we will be talking about for a long time to come.